My focus is on understanding the pathogenesis of respiratory diseases likes asthma, COPD, infections and lung cancer, using laboratory models to identify new avenues of therapy. As a microbiologist and immunologist I’m investigating the role of inflammatory features and immune cells involved in the disease process. I began my research career in organic chemistry at the University of Leeds, principally to investigate intracellular signalling pathways relevant to cancer. I then headed to Australia to undertake post-doctoral studies into protein biochemistry, which involved elements of microbiology and molecular biology that widened my research fields and goals. In 1997 I started to design and test new vaccines against infection with the bacteria Streptococcus pneumonia, piquing my interest in airway inflammation. New treatments for asthma, COPD, infections and lung cancer are urgently needed. We’re currently conducting an extensive series of studies of each of these diseases. Our aim is to identify how they develop and progress. This will enable us to identify new therapeutic targets and develop new therapies for these important diseases. We can then test potential new therapies in human samples. Some of the areas that we are investigating are microbiomes and diets, epigenetics, genomics, mast cells, innate lymphoid cells, macrophages, cytokine/chemokines, microRNAs, etc. In the race to develop urgently needed treatments for airway inflammation disorders such as asthma, chronic obstructive pulmonary disease (COPD), infections and lung cancer, Professor Phil Hansbro is leading the way. Where previously it took six months to evaluate the effects of tobacco smoke – a major cause of COPD – Professor Hansbro’s lab team has reduced the period to just eight weeks. This international breakthrough fostered a paradigm-shifting collaboration with Harvard Medical School. 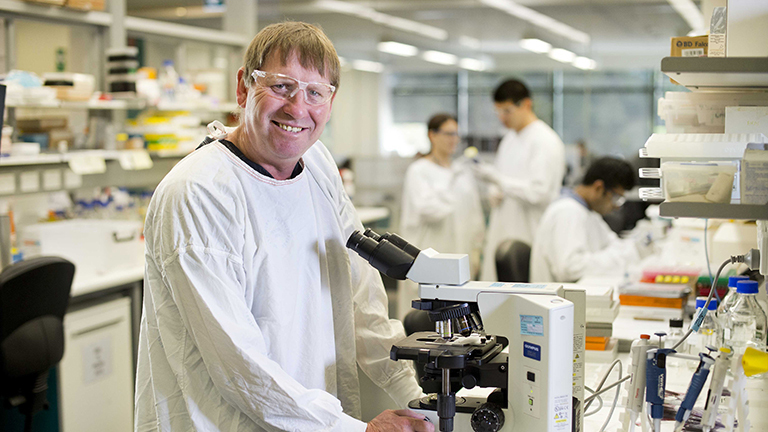 Professor Hansbro has been working in the Hunter since 1999, making outstanding contributions to medical research at a local, national and international level. The primary aim of his research is to use laboratory modelling and cell biology to identify new therapeutic targets. Discovering new lineages of avian influenza unique to Australia, influencing Government decision-making as part of the National Avian Influenza surveillance program. Professor Hansbro’s outstanding publications record includes 95 journal articles in the past five years. The majority of these are in high impact journals; more than half are as first or senior author. His work is cited more than 400 times per year. He also presents regularly at leading international respiratory meetings, while convening the annual Newcastle Asthma Meeting that he founded in 2005. Professor Hansbro holds and NHMRC Principal Research Fellowship and is the Chair Of Microbiology in the School of Biomedical Sciences & Pharmacy at the University of Newcastle and is leader of the Microbiology Asthma and Airways research group in HMRI’s VIVA program. He is also the Associate Director of the Priority Research Centre for Asthma and Respiratory Disease, which draws together around 100 researchers from clinical and biomedical fields at the University of Newcastle and Hunter New England Health. Professor Hansbro has built his team up from just himself in 1999 to 30 researchers in 2016, with 15 PhD students under his supervision.